GET WILD WITH A SOUVENIR PHOTO FEATURING YOU WITH OUR LIVE ANIMALS! Experience the Alligator Farm up close and personal, and take home a souvenir photo to capture the memory! 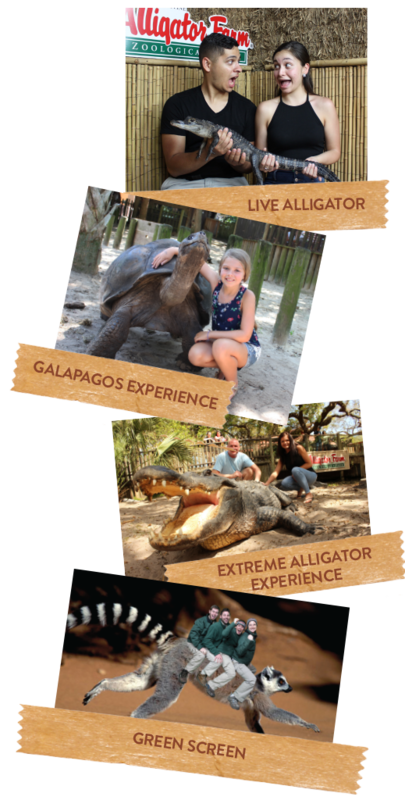 You can hold a small live alligator or snake, pose with the gallant Galapagos tortoises,choose your pick of green screen to pose in front of, or—for the brave—take on the EXTREME ALLIGATOR EXPERIENCE and enter the Alligator Lagoon with a massive LIVE alligator!